I uploaded a new icon picture, but nothing has changed?! No pressure Mods, but I uploaded a new icon picture a few days ago, yet the old one is still there. I recall trying to change it previously, with the same negative result! Hi Jonathon. Yes we mods have to approve any new avatars so there may be a delay before one of us looks in and checks to see if any need doing. There are none to approve at the moment so I assume another mod has approved yours. Is it looking right now? I see a tail view of a pink stick and tissue model? Yes pink stick and tissue model (PRU Spit) is the new one I uploaded, but I still only see my old avatar (interior of fuselage of a blue stick & tissue Auster). Why this is I don't know! Yeap - its just the page cache Jonathon, its being lazy and simply displaying what it thinks hasn't changed! Clear the cache as Stephen suggests and you should see your new avatar. 7,200 odd items in the cache... took some time to finish wiping! Now every single regular page is gonna have to be typed out in full! How on earth have I used a computer for twenty years and not been aware of that? Ok Mods, sorry to add to your mod-load, but I've just changed my icon picture again (a small version of the pic below) and can it please be approved? Because...errr... the pink was a bit extreme and was clashing horribly with the website red, and the new one actually shows it to be a Spit more clearly, albeit one that weighs only 37.5g. 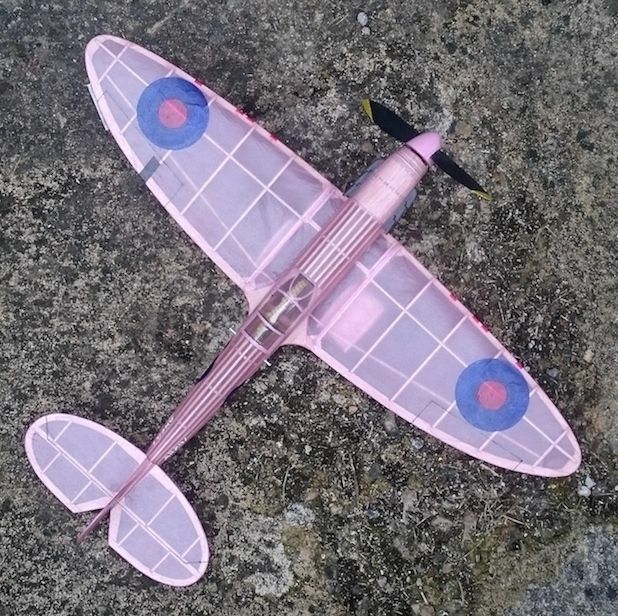 Interesting how, although the pink made the PRU pilots feel vulnerable against the enemy, setting a model against a grey background (as per the new icon piccie) shows how effective the colour was for reconnaissance work. I think sorties early and late in the day were the norm, so the lower sun would cast longer shadows and make object-interpretation clearer. UMM, you're right, both now show the Hurri. I don't have the necessary permissions to edit anything in the classifieds, so could I suggest that you try placing the Bf110 ad again, using the correct image and then delete the existing one? 1 articles Unmagnificent, check your thread about this question. Beth has asked you to send her both pictures so she can fix things. Oops just seen this so I'm off to do it now..... Thanks! UMM. Unmagnificent... all sorted for you! I'm also having a frustrating time with uploading an avatar. I want my ATC squadron badge to show and having tried to upload and crop a square avatar, I cant seem to get it to save it with the whole crest showing. I have just tried again by using F5 to clear the cache so hopefully, it may work this time? All Forum Topics > Forum User Guides > I uploaded a new icon picture, but nothing has changed? !